Not to be confused with Fort Belknap, a historic fort in Texas. Fort Belknap Agency is a census-designated place (CDP) in Blaine County, Montana, in the United States. As of the 2010 census, the CDP population was 1,293. 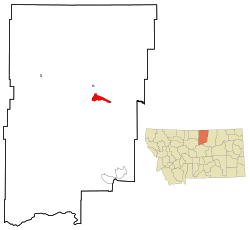 Fort Belknap Agency is the capital of the Fort Belknap Indian Reservation. It is located at the northern end of the reservation at the junction of U.S. Highway 2 and Montana Highway 66. The town is the home of Aaniiih Nakoda College, as well as other facilities such as the Fort Belknap Hospital, an office of the Bureau of Indian Affairs, the Fort Belknap Tribal Council and Tribal Police, and a highway rest area. Fort Belknap Agency is located at (48.468779, -108.755390). According to the United States Census Bureau, the CDP has a total area of 45.8 square miles (118.5 km2), of which 45.5 square miles (117.8 km2) is land and 0.27 square miles (0.7 km2), or 0.56%, is water. As of the census of 2000, there were 1,262 people, 345 households, and 287 families residing in the CDP. The population density was 116.4 people per square mile (45.0/km²). There were 380 housing units at an average density of 35.1/sq mi (13.5/km²). The racial makeup of the CDP was 2.61% White, 0.32% African American, 95.64% Native American, 0.08% Asian, 0.16% Pacific Islander, and 1.19% from two or more races. Hispanic or Latino of any race were 1.51% of the population. There were 345 households out of which 50.7% had children under the age of 18 living with them, 40.9% were married couples living together, 32.8% had a female householder with no husband present, and 16.8% were non-families. 14.2% of all households were made up of individuals and 3.2% had someone living alone who was 65 years of age or older. The average household size was 3.64 and the average family size was 4.00. In the CDP, the population was spread out with 41.8% under the age of 18, 12.4% from 18 to 24, 25.2% from 25 to 44, 16.3% from 45 to 64, and 4.3% who were 65 years of age or older. The median age was 22 years. For every 100 females there were 90.6 males. For every 100 females age 18 and over, there were 88.9 males. The median income for a household in the CDP was $22,000, and the median income for a family was $23,583. Males had a median income of $26,364 versus $20,833 for females. The per capita income for the CDP was $9,053. About 37.9% of families and 38.3% of the population were below the poverty line, including 39.0% of those under age 18 and 56.1% of those age 65 or over. Fort Belknap Agency, Montana Facts for Kids. Kiddle Encyclopedia.